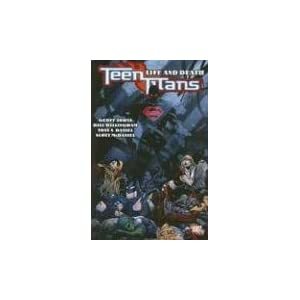 Teen Titans, Vol 5: Life and Death is the next book in the newest incarnation of the Teen Titans. It's getting closer to the time of Infinite Crisis, and things are definitely changing. The Titans have to deal with deceased members of the time returning from the dead and all the pain and horror that entails. Brother Blood and many of the newly-returned-dead are closing in on them, and they are trying to find out which side of the line they're going to be on. Along with this, SuperBoy has some of his own demons to face as he tries to figure out what his purpose is. Just as he is figuring out what his importance is, he must battle his counterpart from a much darker world. This was one of the saddest graphics that I've read in the Teen Titans line. Not everyone makes it out alive, and the final panels had me in tears. I would definitely not recommend reading this as a stand alone, but if you've been reading up until now, you won't want to miss this one. I know that I didn't regret it (though I did know some of what was going to happen because of my jumping around in the continuity, it was still a blow to the chest to see how things worked out.) This may be one that I'll try to get my hands on for my own collection.